Long Slit Light Guide | U-TECHNOLOGY Co.,Ltd. ・Superior uniformity and light linearity achieved by industry-leading optic fiber manufacturing technologies. 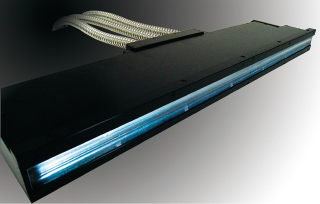 ・Optimal lighting for line sensors based on our proprietary light condensing and diffusing technologies. ・Length up to 3400 mm. Optic fiber lighting is superior in cost efficiency! While LED line lights have a long service life, maintenance of the line light head part may be required due to bulb burn-out or decreased light intensity. Maintenance works required on the line head part result in significant costs for replacement parts, positioning relative to the line camera and optical axis adjustment. Although optic fiber lighting has been conventionally combined with halogen, metal halide and xenon light sources, the service life is extended when combined with LED light sources, which also significantly reduces parts and maintenance costs for lamp replacement. As LED light source replacement needs no maintenance work on the line head, the overall maintenance labor required for the product is much lower. Thanks to VE and VA activities, the initial cost of installation is also reduced to the level of LED line lighting.